Smart in business—dumb in matters of love? "Capitalist"—that common early-20th-century newspaper reference to business moguls of the era—is freighted with a mixture of an awe of masculine prowess and a darker sense of robber-baron-era coldblooded ruthlessness; considering his great success in oil and real estate, no doubt capitalist Albert Llewellyn Cheney got one over on a business rival or two in his day. Whether one believes in karma or not, the tale of his ignominious end in Las Vegas in 1935 makes one wonder. On the way to his desert destiny, however, Cheney—apparently not related to the Llewellyns of #7—crowned his achievements in the business and social worlds of Los Angeles with what may have been one of the most attractive houses on the Square, which he and his wife Sarah built on Lots 9 and 10 and was given the address of #15 when it was completed in 1912.
in Max Linder's 1921 comedy Seven Years Bad Luck. The Los Angeles Times described her as plucky—not every young lady would have taken the news well were her fiancé to announce a few days before her wedding that business in Alaska apparently more important than she would keep him from the altar on the appointed day. Instead, Sarah Libby hopped on a northbound express. The wedding had been scheduled for Thanksgiving Day 1896 at the home of her parents, the Caleb Lillys, in Angelino Heights (a house still standing at 724 East Edgeware Road and now Los Angeles Historic-Cultural Monument #206). Al Cheney was based in Juneau as an officer of the Nowell Gold Mining Company, a young man on the rise—he knew what he wanted, but so did Sarah. It was not, evidently, a case of his having cold feet. After a flurry of telegrams sent in transit, the "lovers"—as the Times quaintly called them—met in Tacoma and were married in an Episcopal ceremony there only a few days after the national celebration. Sarah Libby Cheney sailed down the coast to visit her parents a few times while she and Al were living in Alaska. After the turn of the new century they were back in Los Angeles permanently, Al having entered the burgeoning Southland oil business and both Cheneys beginning to dabble in that other Southern California bonanza, real estate. Sometimes together, sometimes separately (or with Al for business reasons placing some deeds in Sarah's name), the pair bought prime downtown properties, retaining some pieces and flipping others. Later in the decade they speculated with suburban lots, including buying the unimproved southeast corner of Adams and Normandie for $4,000 in May 1905 and selling it five months later at a 25 percent profit. In 1904 Cheney acquired a three-story building at 731 South Broadway, at the time rather far to the south of the center of downtown commerce but to the intelligent investor in the logical direction of business development. The Cheneys collected rents for eight years and then hired one of the most famous of Los Angeles architects, John Parkinson, and his then partner Edwin Bergstrom to design for the site an eleven-story, 30-foot-wide rococo loft building, which appears to have been completed by 1913 but in a much tamer and abbreviated four-story variation—perhaps the cost of their new house on Berkeley Square shortened it. While of course #15 is long gone, the Broadway building still stands and is recognized by some groups as architecturally significant, though you'd never know it to look at it. But it is still referred to as the Cheney Block. Al and Sarah were living during the 1900s in a house on a prime corner of Wilshire Boulevard discreetly addressed as 651 South Burlington Avenue, acquiring during their years of real estate wheeling and dealing Lots 9 and 10 in Berkeley Square, probably from the Burkes. On December 9, 1909, the Times reported that they had engaged the estimable Frederick L. Roehrig to design a two-story, 80-by-40-foot 14-room brick-and-plaster house on which they would spend $25,000. Apparently Roehrig's design proved unacceptable, or at least that of architect Arthur B. Benton was more to their liking. 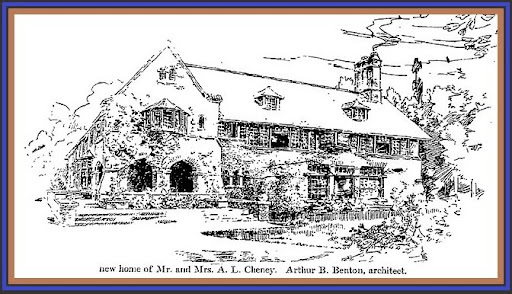 The Times of January 29, 1911, published the drawing seen below, referring to the design as "Early Tudor," and reporting that the foundation had been completed. 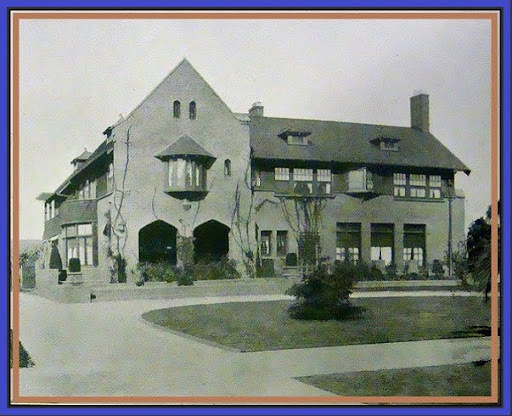 The finished house, as seen at top in 1913, differs in details but appears to be more imaginative than the post-Victorian symmetrical rectangular blocks becoming common in Los Angeles at the time. Its double lot gave it its own park to sit in; Homes and Gardens of the Pacific Coast described it thusly: "A splendid modification of... English architecture.... The first story is of brick construction; the second of timber. A brick terrace extends across the front of the house. The interior is well planned. The hall is finished in fumed oak with wood carvings and tapestry panels. The library is in wood panel with faience tile inset. The dining room and service departments are finished in white enamel and mahogany." The Cheneys and their daughter Catherine Minerva were in residence by the end of 1911. Life at #15 more or less followed the standard Square template of lavish entertaining, card parties and such and, of course, volunteer work on the part of Sarah for Children's Hospital, seemingly all but the street's exclusive charity. Al worked to pay the bills for the not-uncommon Square formula of a house with more servants than masters, for travel and for summers spent up north at Pebble Beach, first at the Del Monte Lodge and later at their own retreat nearby. There was the California Club for downtown entertaining, and the Los Angeles Country Club and the very fashionable Crags up in Calabasas for more rural outings. Square inhabitants were by all accounts close, mentioned together frequently through the years at parties both at home and elsewhere; there is an athletic energy seemingly fueled by the California sun in every event written of by breathless newspaper reporters of the era even through the '30s, an admiration of achievement and of lives that seemingly could get no better. It might nearly have been true—the Depression rarely seems to have penetrated the gates of Berkeley Square. But another sinister force was to slip through the ironwork in 1935. Sometime around 1925 Catherine was married to John M. Taylor; the young couple was listed in the three Southern California social lists of the era as living with Al and Sarah at #15 before they moved north at some point to Marysville. Sarah Cheney died on May 20, 1934, with her obituary likely noted by one Hazel Glab. Ms. Glab, who would become a notorious, only-in-L.A. character, seems to have made it her business to sidle up to the 65-year-old widower Cheney, meeting him by batting her eyes and asking to use his office telephone on the pretext of having a flat tire. Then, using her well-developed powers of persuasion—coercion is not too strong a word—as well as taking advantage of his propensity to enjoy being overserved, she began an affair with the old goat sometime in September. Their trysting place was not #15, on the doorstep of which Catherine Taylor might appear unannounced at any time, but rather at an apartment in one of the buildings Sarah Cheney had owned. There was even the lurid suggestion of extended cohabitation at said apartment; at any rate, Hazel, who was 36, worked steadily over the winter to create a bond with Cheney by keeping him in toddies and various unspeakable intimacies. A road trip to Las Vegas, even then dotted with wedding chapels, was suggested in March 1935 (no doubt Hazel drove the car, for she was on a mission and an accident enroute wouldn't be helpful). After arriving in the desert, so the speculation was at first, Hazel made sure Al was still good and snockered before having him pen, on hotel stationery, a will leaving her everything but the "furniture and furnishings" at #15, which was to go to Catherine—perhaps Ms. Glab had recently seen Gold Diggers of 1935 at a Hollywood picture palace and was planning to replace Sarah's old things with something splashier along the lines of Art Deco. It was later proven that the fake will was originally another kind of document, perhaps just a letter with Al's signature at the bottom. The original wording had been erased, with Hazel writing a convincing forgery of a will outlining her wishes above the signature—while Hazel may have intended to marry Al in the desert, if he was to balk at matrimony she would at least have a document designating her as the major beneficiary of his estate. She had cause to worry that she may never get Al to a wedding chapel prone, given his dipsomania and his having once spoken of wanting to commit suicide rather than marry her. Al did indeed balk at marriage: He died suddenly on May 13, 1935, the day after arriving in Las Vegas. Even if his situation could have been said to be so, however, it was found that his actual demise was not self-inflicted. The investigation of the death would eventually go so far as to have L.A. district attorney Buron R. Fitts order the exhumation of Al's body for chemical analysis—it was suggested that perhaps the gin with which Hazel liberally plied Al contained a little something extra. The old oilman was buried without much press coverage at Rosedale Cemetery back in Los Angeles. Though some sources say Hazel crafted the will months before, it seems to be that, though dated December 7, 1934, the bogus instrument was actually written a few days after Al's funeral—Hazel, it turned out, had enlisted friends, a married couple by the name of Steeger, to help her in the caper, and the purported will was entered for probate on March 23. You'd think a woman as clever as she would have known that Catherine Taylor was not going to be satisfied with a dusty old davenport and some hideous bric-a-brac from #15: The Cheney daughter immediately opposed probate of the recent will and had her lawyers submit as the legal document one her father had written in 1911. In it, all of Al's property was to go to Sarah, and so, according to the terms of Sarah's will, to Catherine. But the real fun began when Hazel, after being on the lam for seven months, was found, and it was revealed that her third husband, John I. Glab, a well-off retired druggist from Cicero, Illinois, had been shot and killed in the couple's driveway at 12744 Ventura Boulevard (a house still standing) in 1928, setting off a new line of investigation. Hazel was quite the actress on the stand in the will trial, but on December 27, 1935, she was convicted of forgery and preparing false evidence. She was sentenced to Tehachapi for a term of 2 to 14 years for that crime; shortly thereafter came her conviction of second-degree murder for killing her husband, the sentence being five years to life. Somehow—and we think much-abbreviated sentences only occur these days—she was out of prison in 1943. Two years later she reappeared in the Times, having been charged with having disrobed in front of a detective and his wife, a cosmetologist, and being intimate with him—earlier on the day of the incident, Hazel had served as matron of honor at the couple's wedding. 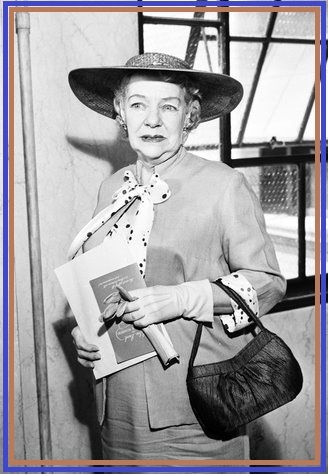 In April 1958, now clearly an inspiration for Bette Davis's makeup in Whatever Happened to Baby Jane released four years later, Hazel was arrested on pandering charges. Clearly the question is: Why hasn't a movie been made of Hazel's life? herself Helen Bridge, appears on a pandering charge in 1958. Once the Cheney scandale had settled down and Hazel Glab was up the river deprived of the ownership she sought, #15 found more appropriate owners to whom its 160-by-250-foot plot was a mere bagatelle. Ernest Albert Bryant Jr. was a son of West Adams, having grown up at 904 West 28th and later, 3210 West Adams Street. 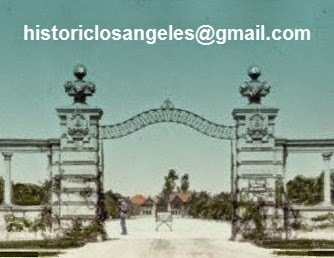 His father was a prominent Los Angeles physician and surgeon; his mother was Susanna Bixby, daughter of the legendary Bixby clan that once owned practically all of what is now Long Beach, large portions of Irvine and Palos Verdes, the Bixby Ranch along the Gaviota coast above Santa Barbara, and vast tracts farther north. Dr. Bryant wasn't much interested in agrarian pursuits, but his wife, though she wasn't to move to the country full time until the doctor died in 1933, was mad for nature. She had inherited large holdings her son would also take an interest in, accounting for both of them being noted as ranchers on Los Angeles voter rolls. Ernest Jr. and his wife, née Judith Tilt, were to remain at #15 until 1946, when they decamped for San Marino. Following the Bryants at #15 were more eminently respectable Angelenos, also with West Adams roots. Francis Haynes Lindley was an attorney whose doctor uncles on his mother's side (one of whom was his namesake) were well-known in Los Angeles. After his retirement from medicine, his uncle Dr. John R. Haynes served the city as president of the Board of Water and Power Commissioners from 1917 until his death in 1937, in addition to holding many other city and county government posts and being the benefactor of numerous charities. Dr. Haynes's West Adams house at 2324 South Figueroa designed by Robert Farquhar, demolished for the Harbor Freeway, appears in Sam Watters's Houses of Los Angeles 1885-1919; Lindley was raised three blocks north at 2007 South Figueroa. 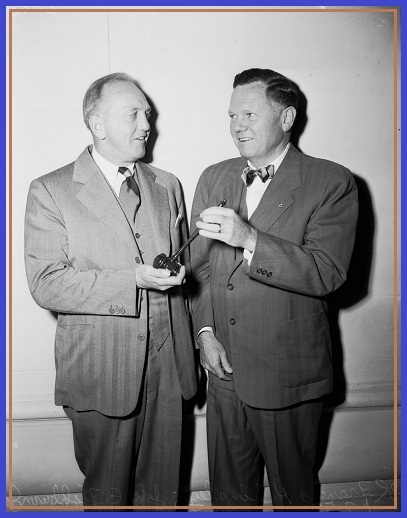 His father was Dr. Walter Lindley, who, among other things, organized the medical school at U.S.C., the first in Southern California; he was also one of the founders of California Hospital. Francis Lindley was a graduate of Harvard and U.S.C. law school and was from 1965 to 1967 a commissioner of the Department of Water and Power. He continued Uncle John's work in the family's Haynes Foundation, which fostered research in the social sciences. In addition to being active in his own law firm, he served as a deputy, and, later, an assistant city attorney. On his watch #15 regained its propriety, which may indicate that with plenty but not too much money comes stability. His mother, Florence Haynes Lindley, sister of all the doctors, died at #15 in 1949. When his sister Dorothy (Mrs. Hawthorne K. Dent to you) died in 1952, services were held at #15. By 1954, Francis and the Mrs., née Grace McCanne, were gone from the Square and living in Hancock Park at 344 South Las Palmas—interestingly, in a house, still there, quite similar in form and style to #15. This gives us another echo of Berkeley Square, in the same way of the Keelys' eventual move to a house at 100 South Hudson Place very like their #11—the only legacies of the Square in brick and mortar. Francis Haynes Lindley died in Los Angeles on January 14, 1987, at age 87. He is buried in Inglewood Park Cemetery. Frank and Helen Lyons succeeded the Lindleys at #15, in residence from 1954 at least until 1960; others appearing in city directories and on voter rolls as living in the house during this period were Jesse W. Brezzel and Norris D. Scott. In accord with the north side of the Square succumbing to motorized progress before the south, #15 vanished from directories after 1960.